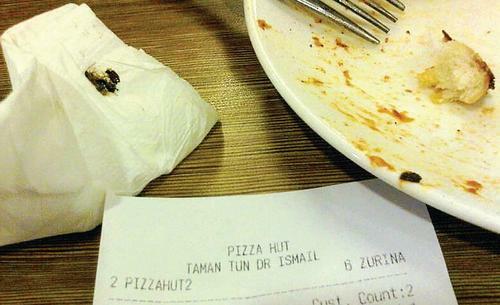 The last thing SOON CHONG HOONG of Taman Tun Dr Ismail expected to find at a popular pizza chain was a cockroach. SOON, 56, says he went to a Pizza Hut outlet in Taman Tun Dr Ismail with his daughter for dinner on June 22. "Halfway through, we noticed a cockroach crawling at the edge of our table," SOON says, adding he caught hold of the pest with a tissue and showed it to the restaurant manager. SOON says the manager made a call and 10 minutes later, told him that the restaurant carries out regular pest control. He says finding a cockroach in the middle of his meal affected his appetite and he felt disgusted. "This incident shouldn't happen in a decent place like Pizza Hut." SOON wants the restaurant to assure its customers there will not be any more cockroaches in the eatery. "I want an investigation started and the staff responsible to be reprimanded as well as a written apology from Pizza Hut."